Fish Farms #51: Wandering through endless boats and village activities on this huge beach looking out onto the Laccadive Sea, our hosts are explaining that these fishermen make a conscious effort with their fishery harvest to rotate through areas they fish, and the have limits on taking any juvenile fish, or certain species. This “management” has been created by village consensus of practice for the benefit of all. The population here is so dense, a failed catch, or a lost resource would jeopardize thousands of lives, so they have all worked together to see that does not happen. Indian researchers find what they have done of great interest, so many have come here to study the community. Our visit today is brief, but endlessly interesting. One of the things I note has many application is the A-frame of palm thatch. Palms are everywhere, so there is an endless supply of leaves. The leaves are woven and roped together to form two panels, that can be spread apart at different angles. The one you see here, is roof to a sleeping area, as this man lives on his boat. Fish Farms #50: As our walk along this huge beach near the southern tip of India continues, Elisabeth and I encounter A LOT of different activities in the surrounding densely populated fishing villages. In the last post, I offer an excellent example of the many use of palm thatch A-frames in this beach culture, in that instance, as a roof above a sleeping area. Here are some other applications. As the day wears on, it has grown hotter, and even though most in the village wear little clothing, it is still too hot to spend time in the midday sun. We are walking with open umbrellas to protect us. 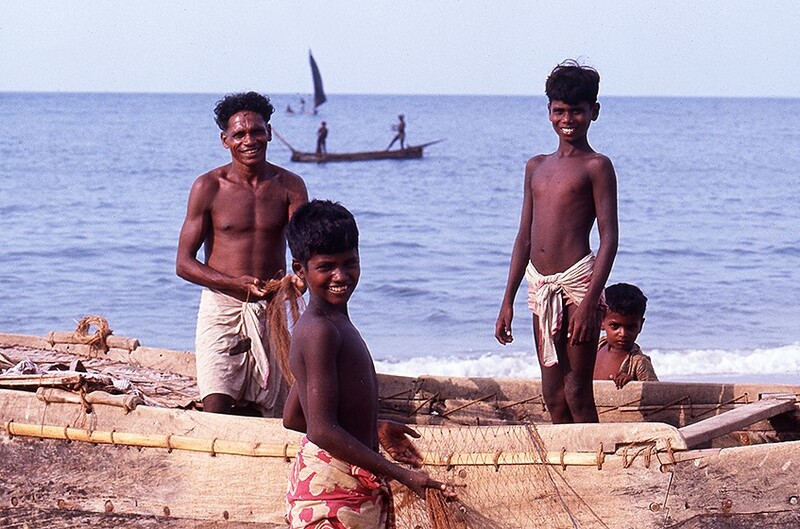 Here use see local fisherman have set up their thatch as a sun-shields while they eat and work on their nets. 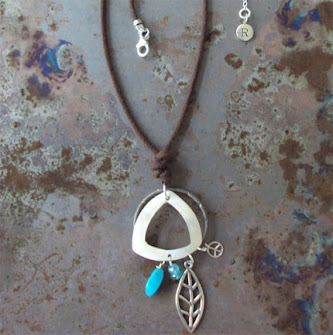 This is an ingenious use of a common material that can be found everywhere here. Fish Farms #49: The aquaculture research trip that Elisabeth and I are on, has now carried us by car around “the horn” of India, departing the Arabian Sea shoreline, and arriving at a very different coast facing the Laccadive Sea and the Bay of Bengal. We are as close to the equator as this part of our trip will get, and it is stunningly hot and humid. We have come to a huge bay SURROUNDED by fishing villages, and although this is not aquaculture in the sense of raising fish from eggs, these villages use of sophisticated form of sustainable harvesting that promotes healthy fish populations and still keeps the villages fed. Our hosts want us to see all of the activity. We leave the car at one end of the broad arching beach, and begin to walk to the other end, where the car will meet us once again. There are people and boats everywhere, and the entire beach is swarming with activity. A large catch has just been hauled in, so there is a wild market going in the distance that we slowly walk toward. It would seem that everyone we pass is attending to their gear. Nets are being mended. 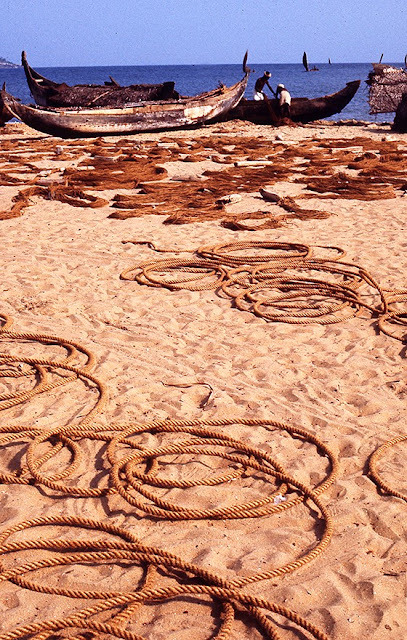 Ropes are drying in the sun. People are making adjustments to their boat, or their personal shelter (sometimes that is one and the same). This is one of the most interesting things we have yet done. Fish Farms #48: Elisabeth, our Indian colleagues/guides, and I have driven around the southern tip of the Indian continent, and are now encountering numerous rural fishing villages on the shore of the Laccadive Sea. It is a long day ahead, so we stop regularly to walk through these communities and witness the buzz of daily activities. 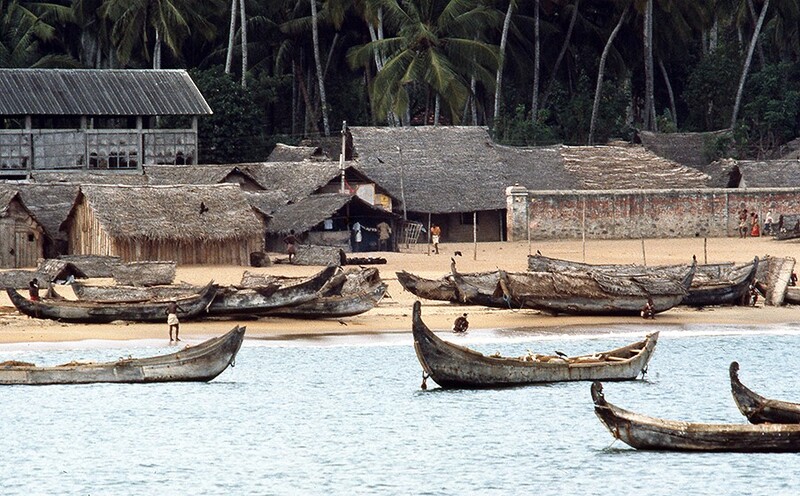 A few thatched roof huts and small shops are on the sand, at the edge of the palms, but many people live on their boats as well, using panels of thatch to cover themselves in bad weather. 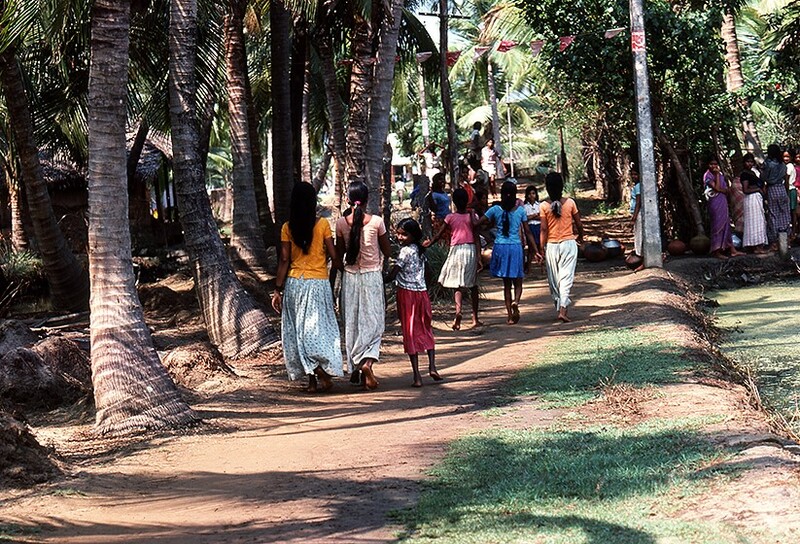 We are close to the equator and it is VERY hot and humid, even at night, so, as you can see, the majority of the people in these villages wear very few clothes, We (our group) on the other hand, look QUITE different, so everyone takes notice of our presence. Those that approach us are friendly and engaging, and most want to talk with us to learn why we are here. Above, is a father and his three sons, currently working industriously on repairing some of their fishing net. Their mother has gone to the spontaneous market that is occurring because a boat has just come in, bearing a large catch. What she can acquire will be their main meal of the day. All of them live in/on their boat - the one you see in this image! Fish Farms #47: Our drive for the day has brought us around the southern tip of the Indian continent, and out onto the coast of the Laccadive Sea. Offshore is Sri Lanka. Onshore, the palm jungle inland is dense, and the beaches are highly populated with villages that are established in the sand. These are communities based around a daily fishing culture to survive, and there are hundreds of large, wooden fishing boats everywhere. The day is abuzz with activity, so we stop at regular intervals on our drive, and walk through the maze, to see what their life is like. Many people are either working on their boats, or mending their nets. In the distance here (above) you can also see a crowd of people gathered at the waterline (upper, right). This is a “pop-up” market, to use today’s terminology. 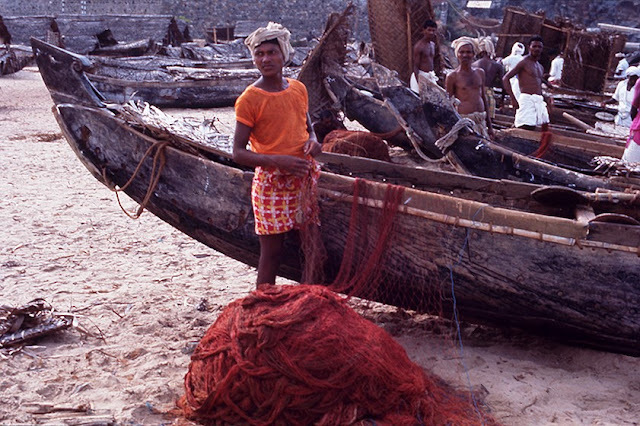 A fishing boat has dropped a net, many people ashore then helped pull the net in, and now they are all standing around making offers to purchase various fish that have been caught. There is A LOT of yelling, and wild gestures, as buyers argue/bid for what will be their main meal of the day. 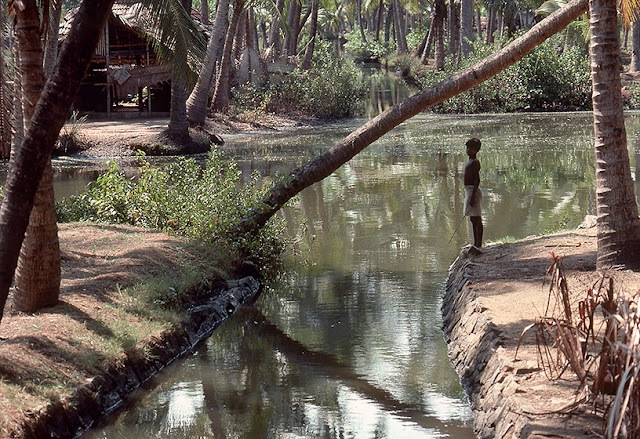 Fish Farms #46: In planning our trip, Elisabeth put more time into India, than any other country we would visit. She did so, because there are so many varieties of aquaculture for us to see. During most of the last 10 days, we have visited research stations and communities working with pond cultures that produce shrimp, tilapia, and six different species of carp. Our travel has presently brought us to India’s southern tip, and we have indulged ourselves momentarily in the beach resort city of Trivandrum. 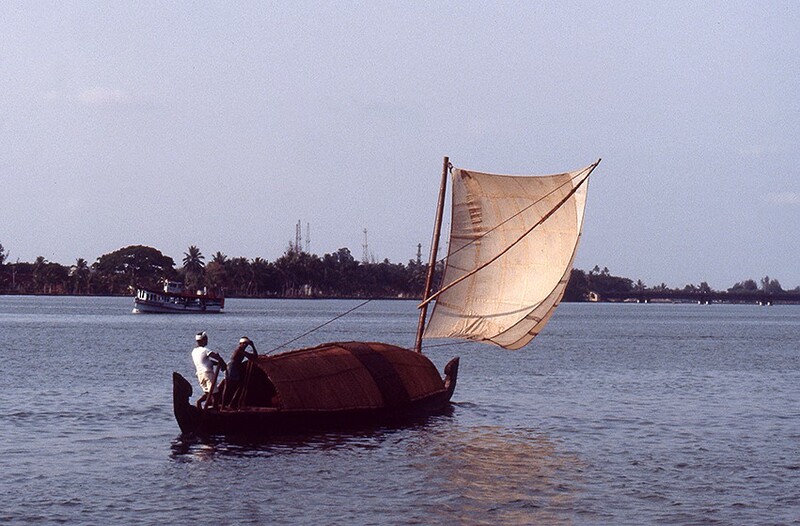 It is now the morning of our departure, as we are heading farther south, around the horn of the continent, and up the coast of the Laccadive Sea toward the Bay of Bengal. Elisabeth is visibly excited, because she says that we are now going into completely different, more rural communities, and we are going to see new forms of farming. The morning is staggeringly hot and humid, and the palm jungle encroaches evermore on the highway we follow. 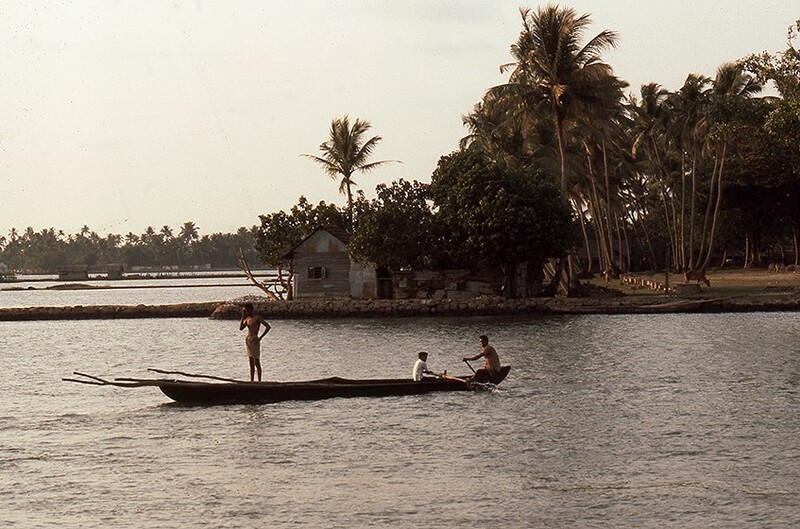 As we round the tip of the continent, and have our first view of the shoreline of the Laccadive Sea, I understand what Elisabeth has been describing. 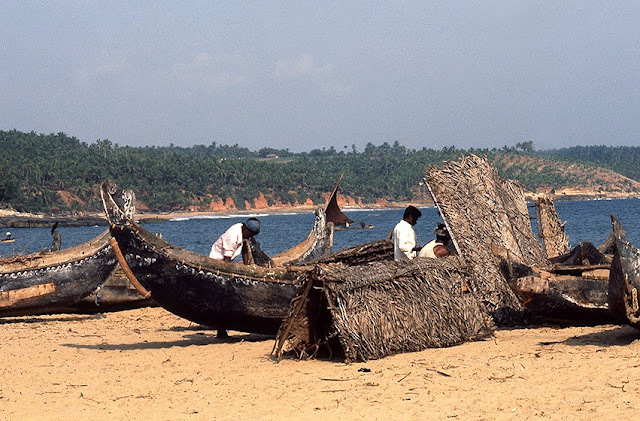 Where we are now, whole communities live, quite literally, right on the beach in thatch huts, or in their huge fishing canoes, covered by thatch roofs. Fish Farms #45: Also, as promised, the beach at Kovalam is beautiful, and to me, VERY exotic. After a stifling day of heat and humidity, Elisabeth and I have tea on my balcony, in what seems to be a slight breeze. As the sun sets, that breeze picks up, and many people begin to fill the various pathways down to the beach. We join them, and by the time we arrive at the edge of the sandy crescent, it is teeming with people. At the edge of the dense, palm-lined shore, there are many thatch-roofed huts among the trees. Some are public bathhouses, others serve food. People are playing, and swimming, and most importantly, a magnificent breeze coming off the water, makes it VERY pleasant. Elisabeth and I sit for some time just to watch all of the activity. Men without women tend to hang in groups. 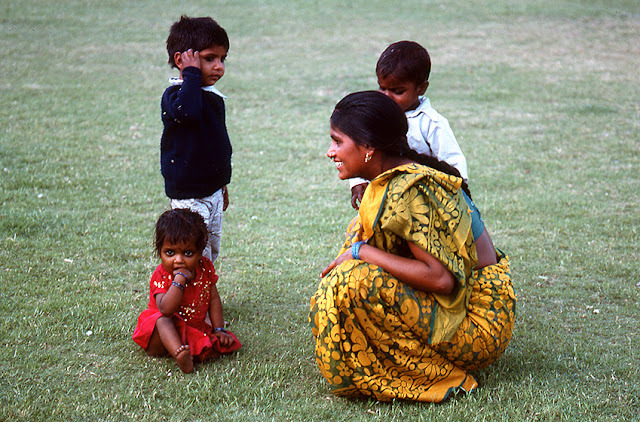 Families also hang in groups, especially around older (eligible) daughters, assuring none of them are inappropriately approached. It is an interesting tension, but clearly, “seeing each other” is intended. I also note that the children swim in shorts, but the adults that enter the ocean, do so dressed as you see here. 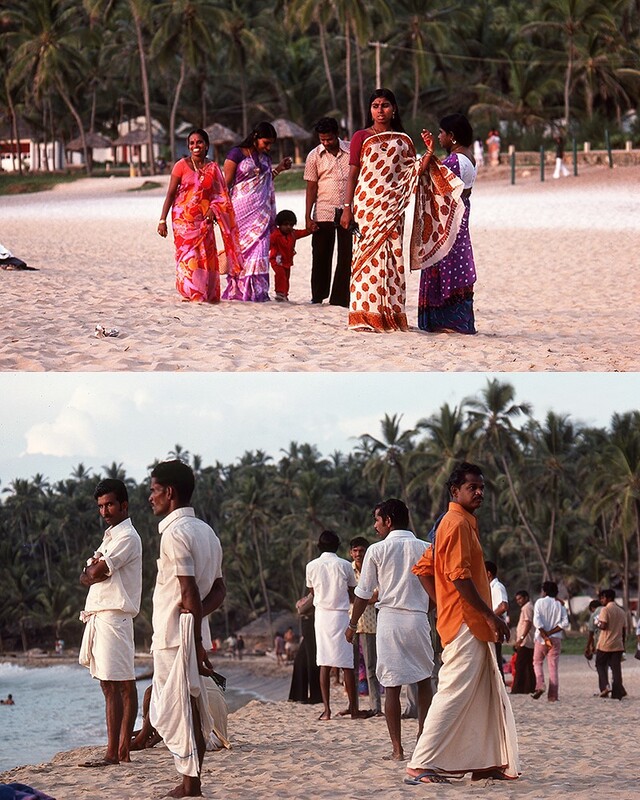 Women go in wearing their complete saris. Fish Farms #44: As promised, the relatively small beach community of Kovalam is VERY beautiful, and extravagantly tropical. The streets, paths, and shoreline are dense with palms, but there are flowering, and fruit-baring trees everywhere as well. I am taken aback by our hotel. Since the luxurious Ashoka in Mumbai, we have been in nice, local hotels, wherever we have stopped. This is MUCH more. It reminds me of a Hawaiian “destination” resort. 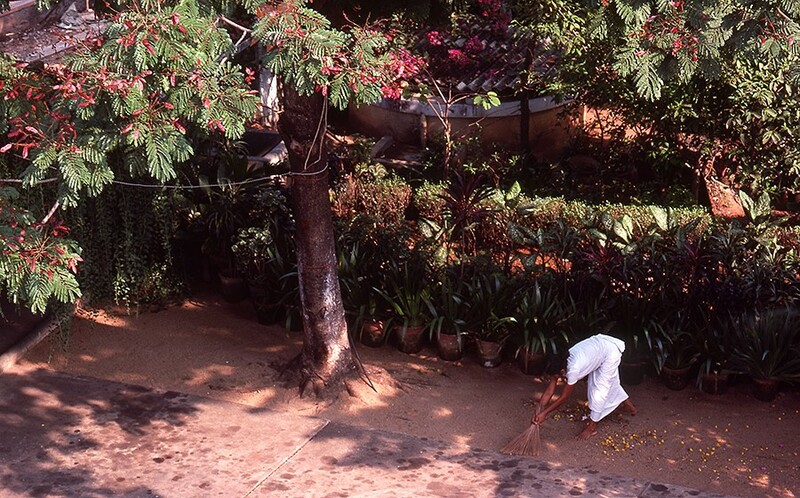 The hotel sprawls with gardens and pathways. Most rooms have sizable patios, or balconies. There is no pool, because the ocean is a short walk away, and the water there can be quite warm, as are our daytime temperatures. Elisabeth has a lower room with a patio, but has come to my room before we walk to the beach. We are sitting on my balcony having tea, and watching this woman rake up fruit fallen from a tree, when Elisabeth points out that she does this, to prevent attracting scavenging monkeys that might annoy the guests. Fish Farms #43: I found the villages, canals, and fish ponds of rural Cochin (posts #36-41) tropically beautiful, but as Elisabeth and I continue our journey further south along the coast of the Arabian Sea, she promises there is MUCH more about to unfold, and she is clearly excited by the plans for our coming days. 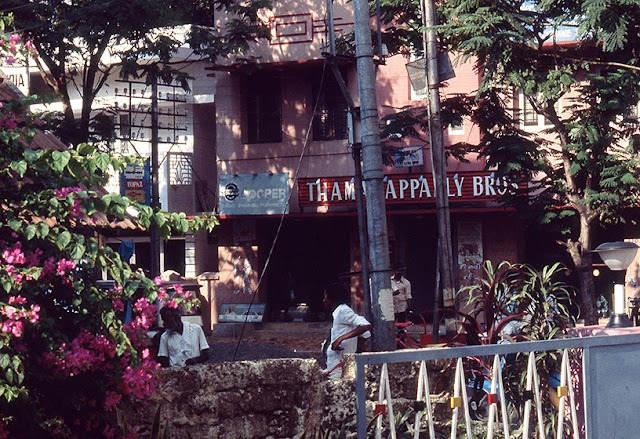 We are headed toward the large, urban city of Trivandrum, that is famous for its beautiful resort beaches, especially Kovalam, the location of our hotel. 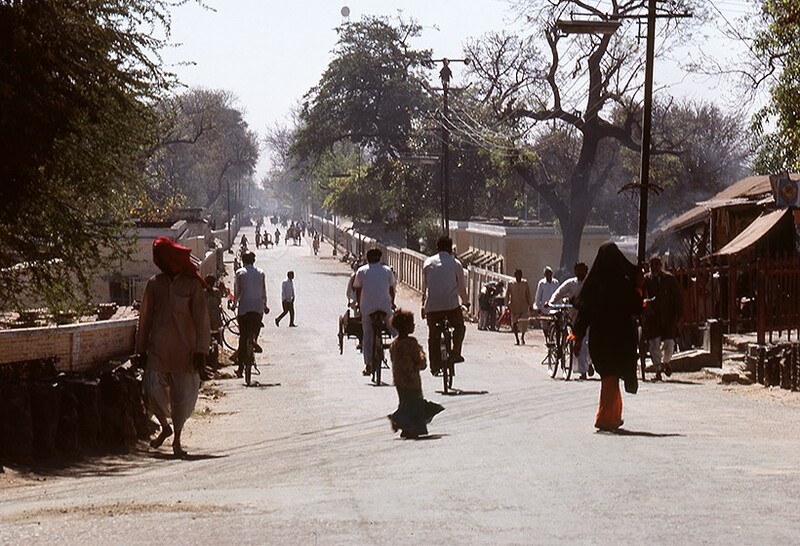 The road is inconsistently paved, and the day is long and hot. She and I often take naps in a heat delirium on these long drives, and do so on this one. 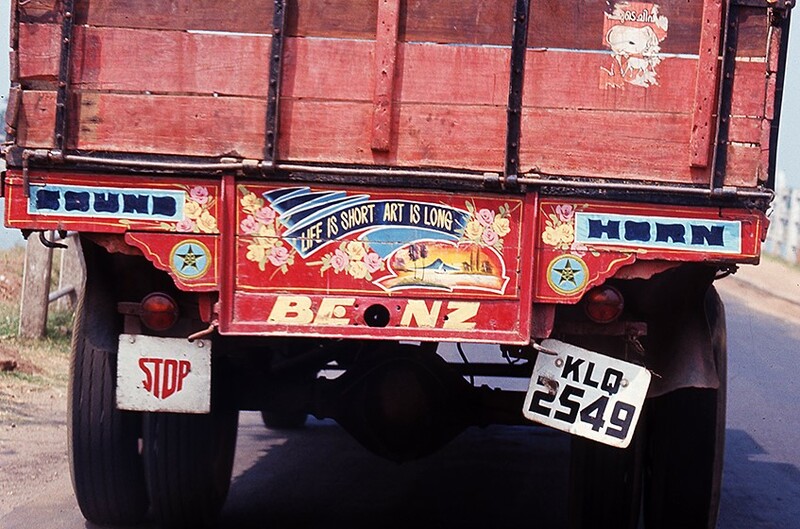 As we approach to Trivandrum, however, the traffic grows worse, so the incessant horn honking does as well, which brings me out of my coma, to find our car following this truck. Inspirational words out of nowhere on a stifling day, and then Kovalam. Fish Farms #42: Back in our car, Elisabeth and I are now going further south to a new location, Trivandrum. Interestingly, this city, which is still surrounded by aquaculture, is the capital of the state of Kerala, and considered a resort destination. Perhaps that is so, but en route, the world seems evermore rural. Much of the road is gravel-bed, with only occasional paving, and at one point we are stopped briefly by a pipeline construction project, that I find remarkable. By any standard, this is a heavy industrial project. LOTS of digging, and many large, sections of pipe to be moved into place. 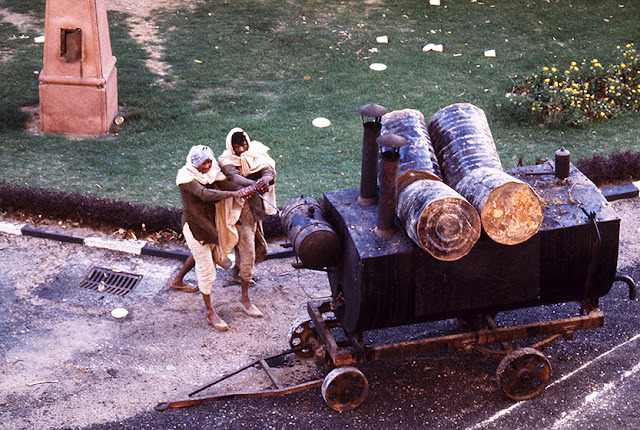 However, there is not one piece of industrial machinery in sight, it is all being done by hand, and with elephants. Look carefully at the image above. It is midday, well into the 90’s, temperature-wise, and the humidity is stifling. ALL of these workers are barefoot, and barely clothed. They are moving a gargantuan section of pipe into place by hand, using boards to leverage and roll it. 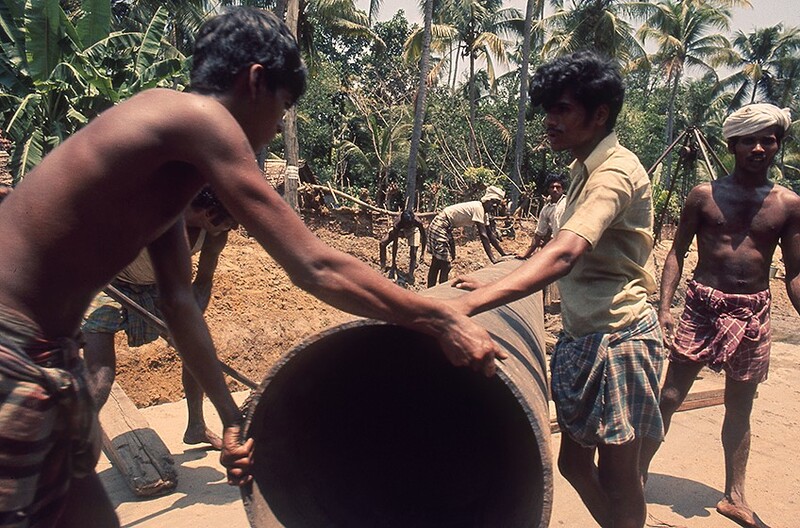 An elephant is then harnessed at the far end, and is used to drag the pipe into the ditch. They work ALL day like this. It is amazing to see. Elisabeth tells me they earn less than one American dollar for their time. Even more amazing..,or shocking as the case may be. Fish Farms #41: Shrimp are one of the most prominent forms of aquaculture in this community, but the endless maze of ponds supports other species as well. There is also some rice grown. As our group begins the return to our car, we encounter another interesting aspect of this system. Ponds are rotated through a series of uses, which “renews” them. After the fish crop is harvested, a pond is drained, then duck farmers arrive, herding large flocks of birds that eagerly descend into the debris on the muddy pond floor to gorge on whatever they can find. While doing this, they poop, in effect, fertilizing the pond floor. When they leave and the pond is refilled, either the new species of fish introduced, or a rice crop, will benefit from this process, without using any chemical fertilizers. I did not know this at the time, but some years later when I entered China in the early 80’s, I encountered goose farmers using the same practice. Very organic - no chemistry or hormones involved. Fish Farms #40: This area surrounding Cochin is a world of canals and ponds through which we have been walking to reach a small research station. The station, like many of the homes in the community, is a very open structure. Constructed mostly of concrete blocks, there is a doorway, but no door; there are windows frames, but no windows, and the roof is palm thatch. The interior consists of numerous water-filled tanks with aerators, that in this case are dedicated to shrimp research, the most prominent form of aquaculture in this area. The station is also located on the banks of one of the larger commercial canals, which is quite active as you can see. 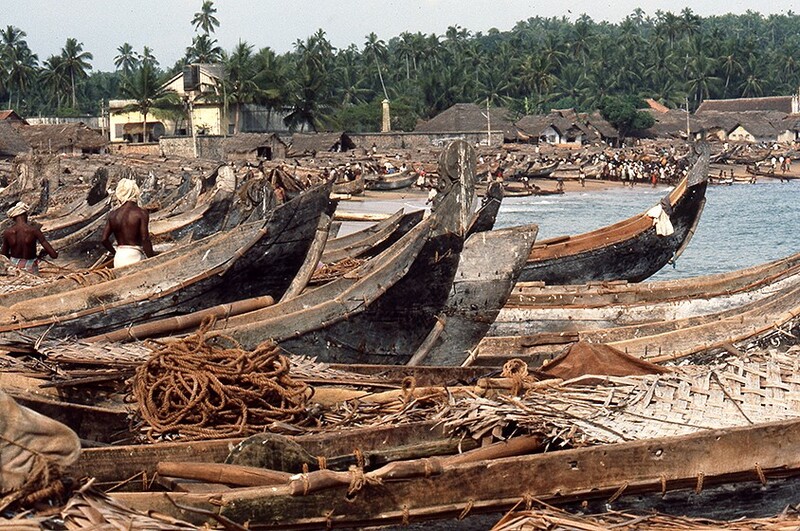 Numerous boats carrying goods are tied to the opposite shore. 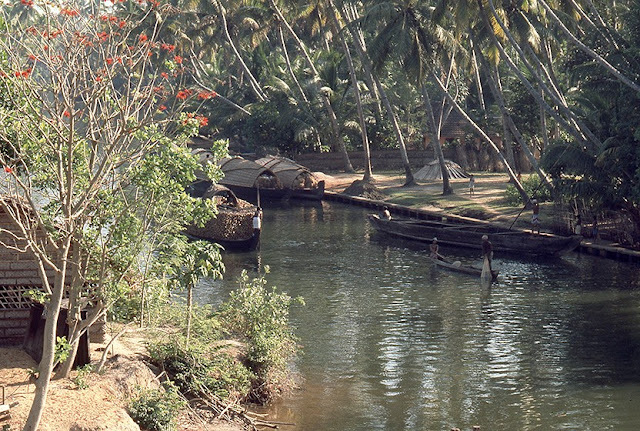 Another craft laden with cut wood has just gone past, and two villagers are actively fishing from their small canoe. The research station is similar to others we have previously visited, but this surrounding is unlike any place I have ever been. Fish Farms #39: Wandering along a maze of dike pathways that traverse between fish ponds and canals, Elisabeth, me, and our Indian colleagues pass through various activities in the surrounding communities. As we draw nearer to the field research station, however, there are increasingly fewer people and structures. The clamor of the celebrating (last post) has been lost, and the jungle closes in around our dwindling trail. Whether related specifically to fish-farming or not, I know this is one of the most amazing mornings of my life, so I keep taking “unrelated” images, like this one - a women quietly doing laundry beside a canal, while a crow offers advice. When we arrive at the field station, it is a work-shed, similar to many others that we have seen. Clearly our walk is the most important part of our experience this day. Fish Farms #38: Part of the reason I am seeing so many women and so few men on our walk through the dike paths of a Cochin aquaculture community, is that the men are still partying over the Janata party election victory of the previous week, and this particular morning, they have gathered in one of the large main canals for wild paddle races. They use canoes made from tall, straight palm trees, that seat 25-30 men. 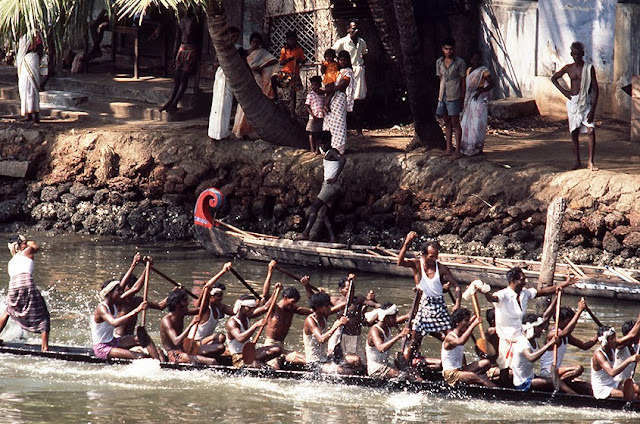 Women and children line the banks to watch in amusement, as boats that can barely stay above water, are furiously paddled down the canal with lots of yelling and wild shouts. The guy standing with his arm raised is supposedly leading the paddlers by shouting out the stroke, but the guy in front of him, I think, is just praying. It is all very funny, and for the community, the presence of Elisabeth and I, is pretty funny as well. Fish Farms #37: Elisabeth and I are on our morning visit to a research station, this one in Cochin. We are in southern, equatorial India and it is a VERY hot, tropical environment. We finally find ourselves in a landscape literally defined by the presence of aquaculture. Fishing and fish farming surround us as we drive, but eventually we reach a point so rural, the road ends and we disembark to walk through the community. It is a nice day that is not too hot as yet, and our path moves along wide dikes between a myriad of ponds and canals. If you do not know where you are or where you are going, you could easily get lost in this maze. That might not be a bad thing, however. The community is vibrant, friendly,..and VERY curious to see an older white woman and a young white man draped with cameras wandering through. I note also that there are large numbers a VERY attractive women, dressed beautifully, everywhere, and no men can be seen. Clearly this is paradise. Fish Farms #36: Our first morning in Cochin, Elisabeth and I wake to a hot, and VERY humid day, have a spicy breakfast at our hotel, and then we are joined by her close friends, now our hosts and guides for this region. Within minutes of our first drive beginning, the landscape is COMPLETELY transformed. We enter a world of water, and water culture. The road we follow bridges large canals, with views like the one above. 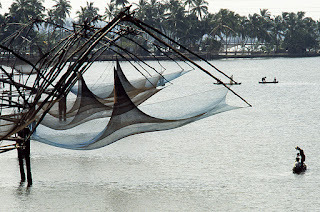 This is not aquaculture, it is dip-net fishing for shrimp and small fish, and each of these nets is connected to a home. These communities of houses line the shores of large canals. In the background, however, you may begin to get a sense of this new environment that surrounds us. It is very tropical. There are palms of every description. The entire landscape is one of ponds, dikes, jungle paths, and a few roads, one of which we are now navigating toward a field research station. Fish Farms #35: The next day we travel, and as we progress, the tropical jungle asserts itself evermore and rivers, canals, ponds, and the amazing coastline just keep getting better. The day keeps getting hotter, as well. We plan to be in Cochin by the afternoon, and to dine with those who will be our hosts in the area. Aside from the heat and humidity, the car ride is pleasant and we do make Cochin by early afternoon. I thought this might give you a flavor of the camera needs I manage. 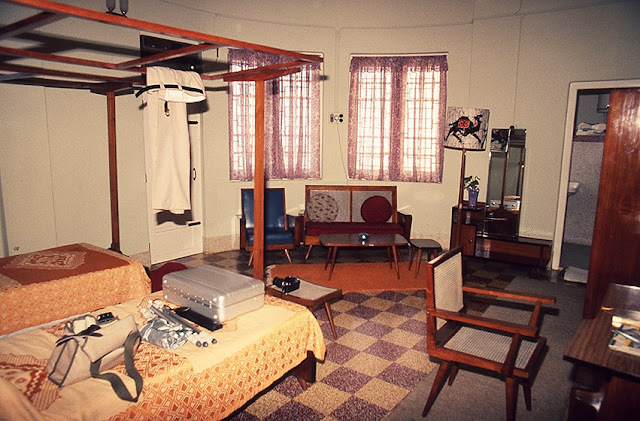 This is my Cochin hotel room. The two beds have a frame above them that supports mosquito netting, to be installed later. My pants are hanging there because they are soaking wet from my sweating into them throughout the long drive. Someone will soon come to claim them, clean them, press them, and return them to me for use tomorrow. On the bed is my camera and film field system. 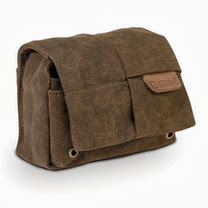 The brown shoulder bag has foam lining and cold packs into which the several hundred rolls of film I am working with, are placed to keep them from the heat. The cold packs are re-frozen at each stop. Next to the shoulder bag is a plastic bag lined with an aluminized mylar shirt. The shirt insulates the rolls of film I work with on any given day and the plastic bag limits exposure to humidity. Next is a small tripod, then a compact Knirps umbrella (which gets used a lot, for sun as much as rain), and then my aluminum Pelican case that holds many lenses and other camera bodies. Lastly, my Nikon F2, sits on the small table. The best part of this room, however, is the all-tile bathroom (through door on right) with 4 different directional shower heads and a drain in the floor. With it this hot and sweaty everyday, these people know how to bath!!! Fish Farms #34: Our dinner boat ride reveals what Elisabeth has been promising, a literal “landscape of aquaculture.” As I will learn, this is just a beginning. The restaurant in which we dine is located adjacent a multi-pond “farm” that is raising several species of fish and shrimp. Talk about "farm-to-table!” We order by selecting our primary fish, and various fruit and spice ingredients. That fish is then captured from a pond, cooked immediately, and served to us with our preferred additional choices, in a “house-style” combination that changes every night. The meal is zesty, but delicious, and I sense a new spice creeping into our palate as we move south. It is making me sweat more. When I ask why we eat such hot food, in a place that is so hot, our host asks me if I am sweating, and then assures me, I will be greatly cooled off by the boat ride home. And so I am. 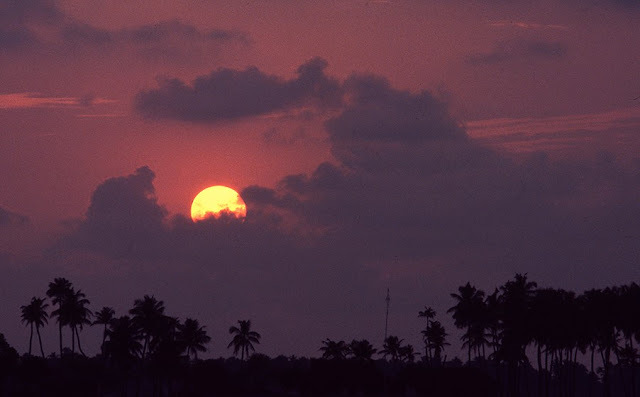 It is a BEAUTIFUL tropical night, and tomorrow Elisabeth says we will enter the landscape that is the heart of India’s aquaculture, southern Kerala and the city of Cochin. Fish Farms #33: Farther down the coast of Kerala, Elisabeth and I begin to come into “aquaculture country.” She has been telling my about whole communities built around various aquaculture activities, but so far we have only seen some relatively small, random sites. Then, arriving at a lovely village by a bay, we check into a pleasant hotel, and connect with her next group of friends with whom we will have dinner. Of course we go by boat, and as we leave the bay for one of the fingers that extend from it, things change substantially. The jungle asserts itself and becomes very tropical. Thousands of palms grow everywhere, AND as you can begin to see in this image, the landscape of water is changing also. The canal we are in remains unobstructed, but ALL of the side bays have been divided up with low dike walls separating fish ponds. Three large ones are visible in the background here. Note also the thatch-roofed huts at various locations on the dikes. These are huts of “watchers,” who feed and care for the fish, but also keep the catch from being poached. Fish Farms #32: As Elisabeth and I travel south along the coast of India and into the state of Kerala, we stop to visit numerous friends of hers, who host us and show us about their cities. All are connected to her aquaculture research in some way, and many take us to small substations where lab and tank research is being done. Elisabeth prefers I not make too many pictures of these places because Abrams already has been sent many similar subjects by the scientists working at those numerous locations. My mission is the landscape of aquaculture,..the setting in which it evolves and flourishes. I do not see that in any significant way as yet, although there is a fishpond here or there, but I do see fishing everywhere, and am dining in a society that eats a lot of spicy seafood. 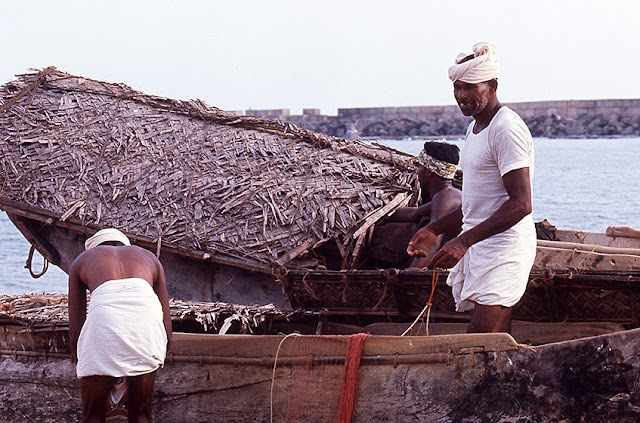 The shot above is not aquaculture, these are traditional net fishermen, working very early in the morning to provide food for their village. This is a large industrial harbor, and what struck me here was the juxtaposition of the new technology and the ancient ways, one co-existing in the shadow of the other, seemingly successfully. Fish Farms #31: As we travel south along the Goa Coast and into the state of Kerala, we are approaching the equator in pre-monsoon season, and things are HOT, and getting hotter. Elisabeth knows many colleagues along the way who host us, and the pattern seems to be early morning trips to some research stations, usually by water, then long lunches and an afternoon nap to pass the peak heat of the day. As the evening cool down begins, we reassemble for a little discussing, and a lot of socializing. Some of those we visit are in large commercial port cities, built around substantial bays into which feed numerous canals and rivers. Out on the water is always interesting because we see everything from supertankers, to people on sailing rafts. It is a waterworld. However, Elisabeth has described entire communities built around aquaculture, and we have yet to see that. Fish Farms #30: Because we are still not photographing aquaculture, the point of my trip, I am trying to conserve film to assure I will have enough for my assignment, but at the same time, I realize I am in an amazing place at an amazing time. In the company of Elisabeth’s friends, we ride a water taxi to lovely open-air restaurant located in a discreet corner of a large bay, that is also a very busy port. 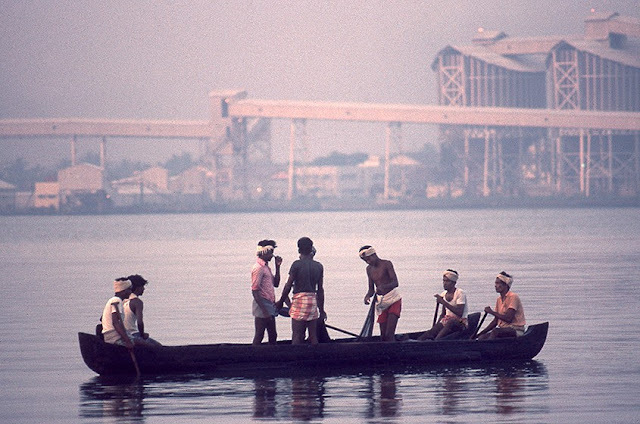 There is a striking contrast of old world-new world here because in the flow of traffic there are modern industrial cargo ships, a wide variety of unusual sailing craft, and many people fishing from dugout canoes. The breeze from the motion of the water taxi is refreshing, and the evening light is radiant, so once again I am seduced, I feel I should at least take a few pictures. Fish Farms #29: We are met at the airport in southern Goa, by several friends of Elisabeth’s, and they will drive us further south, into the state of Kerala. The drive follows a beautiful tropical coast whose vast beaches are punctuated by cities concentrated around bays and river estuaries, supporting a lot of boat traffic. At the end of our first day of driving, we arrive at one such city, where there are more friends, to whom we are being handed off. We are close to the equator, and just before monsoon season is to begin, so it is VERY hot and humid. Our new hosts arrange a nice hotel on the water, and then make plans to take us to dinner. Dinner is a long process that involves cooling down at the end of the day. 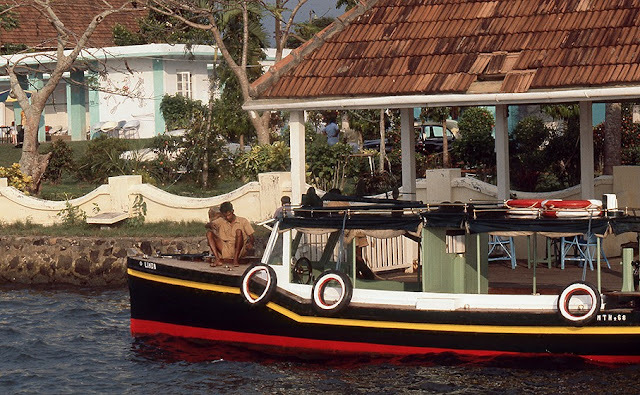 It starts with a lengthy water taxi ride, out into a vast bay, then eventually up one of the the less traveled “fingers” of water that stretches back into a jungle-like environment, where there is a lovely, open-air restaurant at the water’s edge. It is a beautiful evening, a lovely boat ride, a GREAT dinner,..and I do finally cool down,..a bit. Fish Farms #28: The drive back to Mumbai from Agra passes more quickly without the chaos of the election excitement filling the streets. Elisabeth and I spend one final day sorting our travel plans with our hosts, and packing to travel, then we are off. It turns out, Elisabeth has many friends along our route that she intends to visit. We will first fly to the southern Goa coast, then from there, journey south by car, into the state of Kerala. Traveling along the coast reveals a tropical paradise. For me, it has the feel of Hawaii, only it is hotter and more humid. There are expansive beaches lined by palm trees, things are flowering everywhere, and the principle cities are built around big bays and river estuaries, so water, and water travel abound. Fish are a big part of the regional diet. I am told aquaculture is everywhere. Fish Farms #27: Elisabeth and I are wowed by the Taj Mahal. Not only is it beautiful and monumental architecture, it is intricately detailed on virtually every surface. The stone carving and inlay designs are mind-boggling. 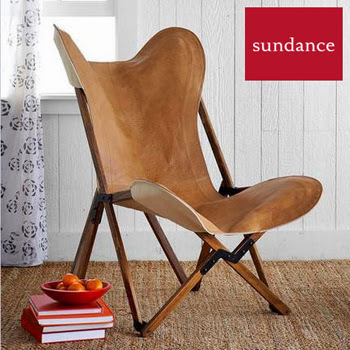 As beautiful as it is to look at, inside there is also acoustical perfection. It is also MUCH cooler, as the marble walls fend off the sweltering day, and there are rooms in which one can stand in a corner, face to the wall, and say something in a whisper to a person in an opposite corner, which they will hear perfectly. We spend a good bit of our morning at the Taj, but I am now confronted with the reality of my assignment, and I fear I am taking too many pictures and using too much film on subjects not related to aquaculture. 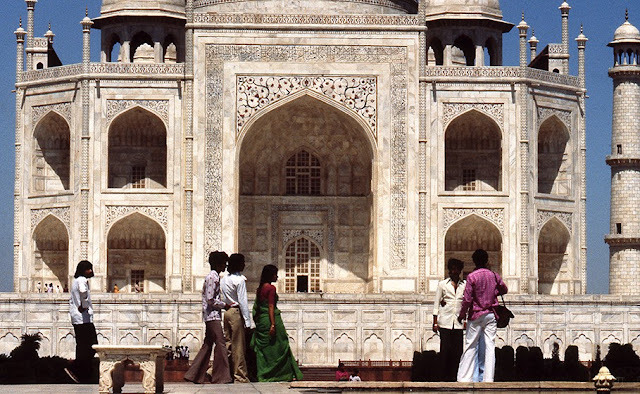 As it is still the weekend, there is no need to be back in Mumbai, so it is determined we will stay another night in Agra, and spend the rest of this day visiting some other significant monuments in the city. I decide it best not to shoot more film unless something really amazing occurs, so there are no pictures from the rest of the day, or the drive back to Mumbai. We do return to the Taj for a beautiful sunset, however, and we have a really great dinner with live music. Fish Farms #26: Given the bedlam in the streets because of the Janata Party election victory, our drive to Agra to see the Taj Mahal has taken most all of a VERY hot day. We are now exhausted, sweaty, and would like a shower and some food. 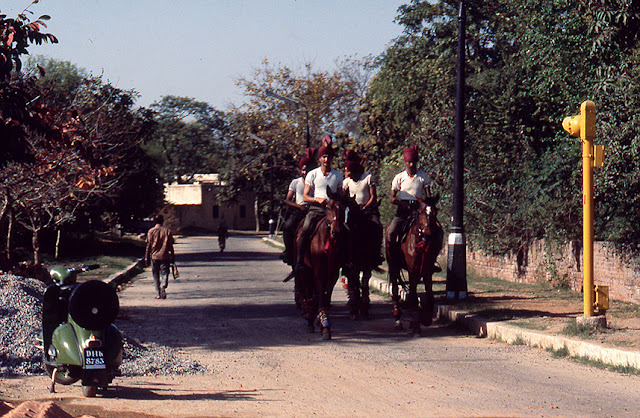 It is early evening when we finally arrive at the edge of the river (last post), and although we can see the Taj Mahal at a distance, our first intent is to find a suitable hotel and freshen up, which we do, AND it is within walking distance of the Taj. We have a pleasant meal with our driver, retire early, and awake the next day to breakfast and sightseeing. It is another clear, and very hot day, so we start early. 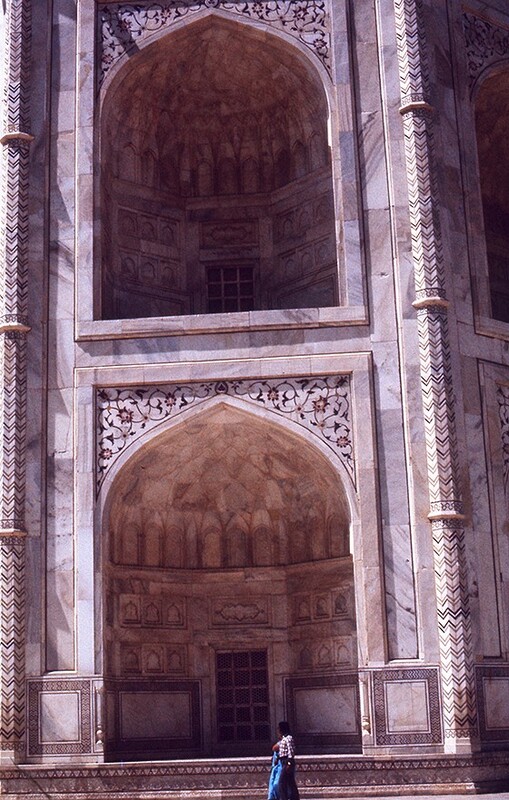 From a distance, the Taj Mahal is impressive because of architectural design, scale, and setting, but as you walk closer, the astounding details begin to emerge. 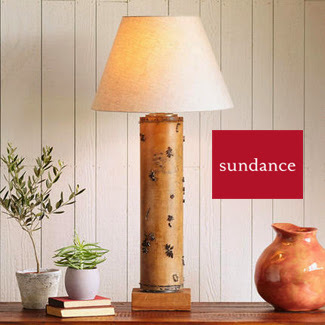 The radiant white marble, reflecting sunlight, obscures much of the intricate, inlaid designs, but as our eyes adjust upon our approach, the scrolls and floral flourishes become VERY apparent. Once on the grounds, every step we take is more breathtaking. While the scale of the building continues to grow, the extravagance of the details seems evermore impossible. Every surface is decorated or carved, and there are A LOT of surfaces. Elisabeth has traveled all over the world and has seen many things, but I realize that she is truly blown away by this visit, AND, historically speaking, we are fortunate to see it when we did (1977), as air pollution is now threatening to discolor the marble and dull the brilliant white radiance. Fish Farms #25: It is a VERY long, hot day on our drive to Agra. The fact there is also a national election and the streets along the way are crowded with celebrations, makes our progress that much slower. Towards the end of the day, when it becomes clear the Janata party has won a major victory, the streets turn into bedlam. We have been in the car for hours, and I am beginning to wonder if we will ever get there, and then this appears. It is the Yamuna River, which runs through a portion of Agra. We are finally close. Elisabeth agrees that we will all stay overnight (our cab driver, as well), because driving back in the dark with all the election celebrating would be insane. Making a joke, the cab driver points to the activity on the river shore, and he says he knows the hotel is preparing for us, because they are washing our sheets. 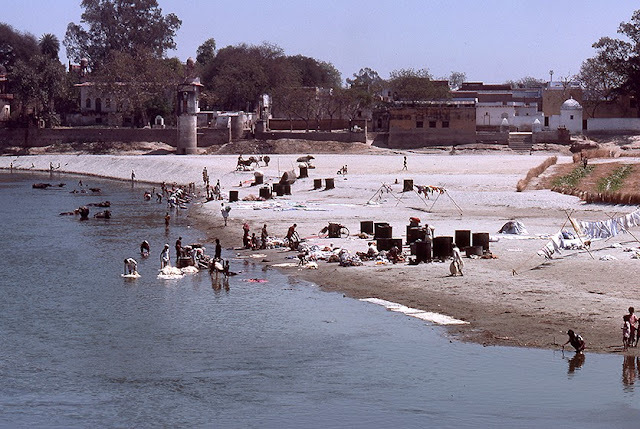 The fact is, because of the numerous tourism visits to the Taj Mahal, there are many hotels in Agra, and these workers ARE washing the hotel linen in the river. This gives Elisabeth and I some pause for thought, as most rivers in India are quite polluted with human waste, and if you look carefully upriver in this shot, you will see 8 head of cattle “bathing” just beyond where the sheets are being washed. Oh well! On to our hotel. Fish Farms #24: Caught up in the organizing and research around our aquaculture project, Elisabeth and I have paid little attention to current Indian news. If we had, we would know that India is in a HUGE electoral moment when the established political party, is being challenged by the JANATA - the people’s party, and a new Prime Minister is going to be elected. Because we are not paying attention, it turns out the day we choose to drive from Mumbai to Agra to see the Taj Mahal, is the SAME day as this highly anticipated election. As we drive on, and the day wears on, the public frenzy of this election begins to assert itself on our trip. Outside of Mumbai, the rural villages we pass through are increasingly crowded, and EVERYONE seems to be in the streets. 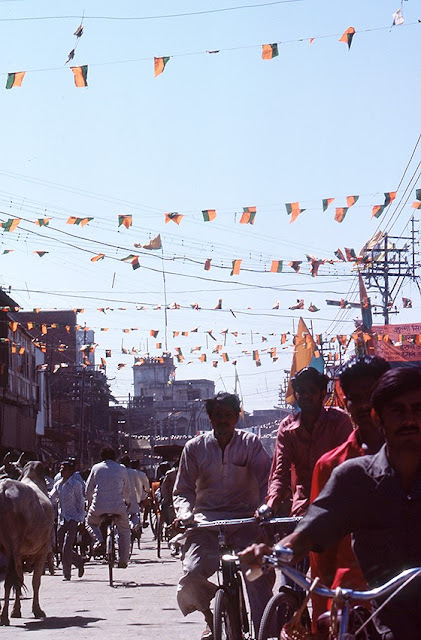 You can see here, these villages are also very pro the Janata party, and the streets and buildings everywhere are decorated with the orange and green flags of the party colors. Talk about strangers in a strange land, Elisabeth and I are slowly realizing that something is up, and when we ask, our cabbie explains the circumstances, to which Elisabeth exclaims, “Oh, my god!”, realizing that out here in the villages and country roads, things might get a little crazy. Too late, they already have! All the activity is a surprise to us, but check out these guys - a white women and a white photographer in a car driving through their main street is as weird to them, as the day is to us. In the end, a good time is had by all. The crowds turn our travel into a crawl, but make for considerable excitement, and something more than your usual sightseeing. Then, by late afternoon, it becomes clear to the populace we are passing through, the Janata Party has, shockingly, won the election! Then it is joyous bedlam EVERYWHERE, and we are in the middle of it. Our poor cab driver must think we are the customers from hell (but he is also happy the Janata have won). Fish Farms #23: Forming My World View through Aquaculture in 1977, #23: With a weekend approaching, we know our “hosts” will not be back with our plans until Monday, and Elisabeth does not want to sit around the hotel for two days, so she has a plan. She and I will go visit the Taj Mahal, located in Agra, several hours away by car. 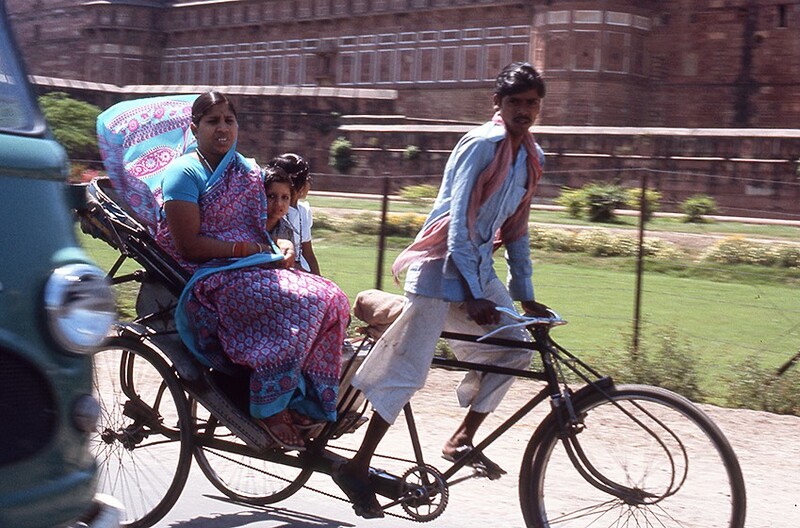 Our first obstacle is finding a Mumbai cab driver that knows how to get to Agra. Apparently it is not as simple as just getting on a connecting highway, because in 1977, there is, as yet, no such thing. We must get there by connecting rural streets and country roads through numerous villages. Our hotel helps us find someone who “thinks” they can do it, and so we are off. This ride provides me with a unique learning curve about managing my cameras and film. The taxi is not air-conditioned, and the day is blazing hot. Inevitably, in the heat of the long drive, Elisabeth and I both fall asleep every once in awhile. I, however, begin to sense even the subtlest change in car direction, that might shift the direct sun onto my cameras and film, and I awake in a heat haze, adjust their position to get them out of the direct sun, and then drop back into my snooze. About an hour into the drive, we are at the far outskirts of Mumbai’s “known” roads, and our driver must now start piecing together all the connections to complete our route. During one of my more conscious moments, I take this shot because I am struck by what I see. What do you see? I am at the edge of one of the largest and most populated cities in the world, and I am looking down a well maintained (and paved) road that, as far as the eye can see, does not have a single car on it. There are hundreds bicycling, and many driving oxen-pulled carts, but there NO cars. This drive is about to get interesting. 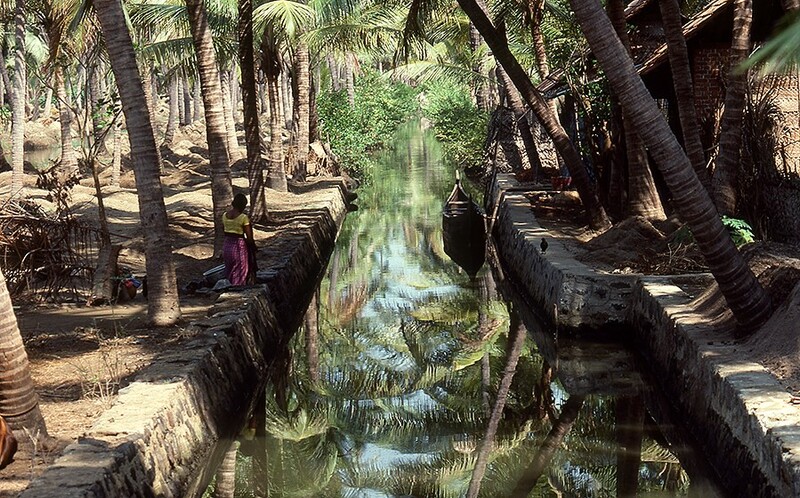 Fish Farms #22: India is a large continent, and one of the most populated. To provide sufficient protein to many millions, India has been engaged in aquaculture practices for hundreds of years. In fact, India has some of the most diverse forms of fishfarming of any of the countries we will visit, so Elisabeth wants to see as many different forms of it's practice as possible, and that takes a lot of organizing. Unlike Russia, where the government did not care to show us what they were doing, India wants us to see it all, and that means nearly two weeks of extensive travel to very differing parts of the country. Organizing this requires some time, so we wait in Mumbai, while our trip is being organized. We actually do visit an amazing facility in Mumbai, whose practices I find shocking, slightly disgusting, and yet, TRULY BRILLIANT. If Mumbai has anything, it has a lot of sewage, so this aquaculture adaptation uses that material. Not far outside of the central city, Elisabeth and I are taken to a more rural area where there is an extensive array of ponds, each separated from the other by a walkable dike. All of the ponds have multiple industrial aerators, furiously sucking up pond water and then spraying it back into the ponds again. This is liquified sewage. Surprisingly, the ponds TEEM with fish! These are carp, and there are A LOT of them. This is an experimental project that appears to be working. In each pond there are 6 different species of carp, and each “feeds” at a different level of the pond. No additional feed is given to the fish, other than the aerated sewage. The project has been going for some years, and the fish are rigorously tested for cancer, toxins, and dangerous microbes, but NOTHING has been found to date. The considerable "white-meat” bodies of the carp, test and re-test as clean, pure, and edible, despite what they are being fed. The Indians believe the carp is a “gift from god,” that might well be significant in recycling sewage into edible protein. Simply AMAZING!. Aside from this visit, we have time to kill while plans are made, so as I mentioned in previous posts, Elisabeth likes to taxi-bicycle about the city to “relax" and enjoy watching the “street-life.” Most foreign visitors, do exactly the opposite, hiring taxis with curtains on their windows, which they close, so as NOT to see or be seen. It is all very amusing to me, as I watch (and photograph) the often shocked reaction of those encountering us, very startled to see foreign visitors using this decidedly local form of transportation. Fish Farms #21: As Elisabeth and I “sight-see” about Mumbai in bicycle taxis, we encounter many interesting things. I will remind you that this is one of the largest cities in India at the time, but amazingly, the airport runway is grass, and very few of the streets are actually paved. Paving must be a brutal job in this heat, but that is what the two guys in this picture are doing. Paving consists of spreading gravel over an area, then pouring a hot tar slurry on top of it, and tamping it smooth as it cools down. ALL the work is done by hand. There is no industrial equipment involved. Needless to say, that greatly limits the amount of work that can be accomplished in any one day, so the process just creeps along, one gravel patch to the next. We are here just before the start of the monsoon season, and I wonder how any of these cities survive and maintain their infrastructure in the face of that kind of weather. I do NOT want to be here to find out. Fish Farms #20: Mumbai is very hot, and there are only a few, relatively brief meetings needed to set up our proposed aqauculture tour around the country, so part of the downtime Elizabeth spends writing and refining her notes, and then she wants to go “see” things, traveling about the city using bicycle-taxis. 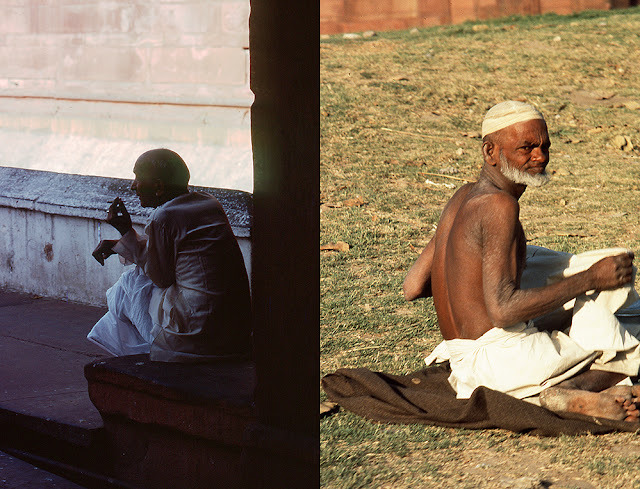 For me, it is a continuing opportunity to observe and photograph people, which I feel I do not do all that well. It is also an opportunity to see a world that is VERY different from mine. Our hotel is at the rural edge of the city, so around us are tree-lined residential neighborhoods with some very nice homes. The sharply dressed riders and decorated horses (above) are the local police on patrol. Elsewhere, in the heart of the city, the world is quite insane. The streets are choked with cars and people. Untold numbers of whom literally live (and cook) on the sidewalks. Beggars are everywhere. Most amazing to me, both men and women choose to defecate “in nature” eschewing toilets for nearby bushes. In this heat, and with such crowded conditions, this just seems to me like a health disaster waiting to happen. Fish Farms #19: Elisabeth and I have come to Mumbai to meet with administrators that have been planning our visit. There is no aquaculture here, so we will soon go to the southern state of Kerala, where many forms of it are practiced. For the time being, however, we have a very nice hotel, an occasional meeting during the day, and a good bit of time on our hands with nothing to do. Our first evening, we are on our own, and I did promise Elisabeth that I would eat whatever Indian food she ordered for me, so we head off for what proves to be a fantastic restaurant. It is elegant and air-conditioned. People are beautifully dressed, and the servers are formal. There is a large band of drummers, sitars, and wind instruments playing great music, and every once in awhile a dancer performs. I do not even look at the menu, and just let Elisabeth order everything. The first plates are pan (bread), some fruit, and some salad-like veggies. No problem. Then, when the main plate comes out, I am relieved to see that she has ordered a simple dish for me of rice and large prawns, and there is little other garnish. Wanting to seem “fearless” about the food, I dive in. Half way through the first prawn, I begin sweating in places I did not even know could sweat. My ears burn. My eyes water. I take in some plain white rice to try and cool down, and the rice is even more spicey. Neither water nor beer seem to make any difference. My mouth is on fire. Trying to appear to be taking it in stride, I pick up the second prawn and glance at Elisabeth who has been watching my reactions. She is laughing hysterically. She also assures me, I will survive, AND she says that I will never be that affected by spices again as this would innoculate me. I do cool down as the meal progresses, and I eat the entire plate. Dinner ends early in the evening, and Elisabeth introduces me to another part of her personality, restlessness. 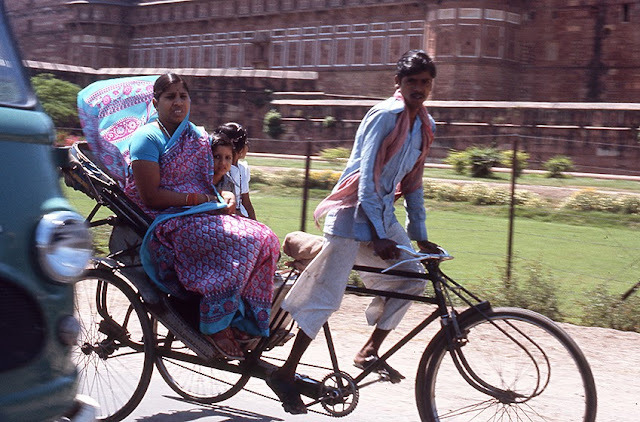 She does not want to go back and sit at the hotel, so we hire a bicycle-taxi and go for a ride about the city. In the days to follow, we would do this several times, and see some interesting sights. The above, being one of many. 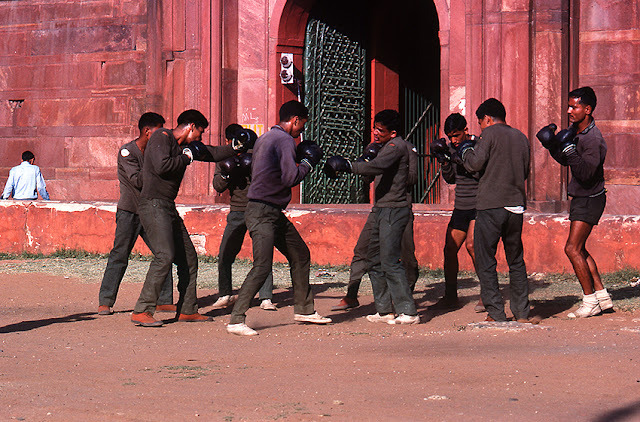 I am not sure what they are doing, or why, they were just simple all punching each other rather randomly. Fish Farms #18: I take a few more shots around the front lawn and property of our Mumbai hotel, and then Elisabeth and I go to breakfast. Russian food seemed familiar to me, but I know nothing about Indian food, and have never eaten it. Elisabeth dives right in, ordering a very “Indian” breakfast. I am relieved to see a very “British” item on the menu, scrambled eggs on toast, which I order. When the meal arrives and we start to eat, Elisabeth scoffs at me for not eating “native.” She says as we travel, in many circumstances we will have to eat what we are served, or go hungry, so I need to “get on board” with local cuisine. I tell her that I will do that, and if she would like to start with the dinner this coming evening, I would allow her to order for me and I will eat all of whatever she orders. She smiles broadly when I say these words, and we return to our breakfast. Fish Farms #17: The lawn in front of our Mumbai hotel hosts 3 elephants and a camel, so many people come to play, picnic, and watch them. This is perfect for me to practice taking pictures of people, which I have always been uncomfortable doing. I see my self as a landscape photographer in the tradition of Ansel Adams and Eliot Porter, and I seldom think much about motion and film speed. Now, those elements are paramount, and I do not have the luxury of taking my time, or setting up a tripod. At the beginning of this project, I explained this to everyone involved, and I was assured that they did not need “people” pictures. The editors felt they already had those images, sent from contributing scientists. I was expected to take pictures of the “landscape” of aquaculture. 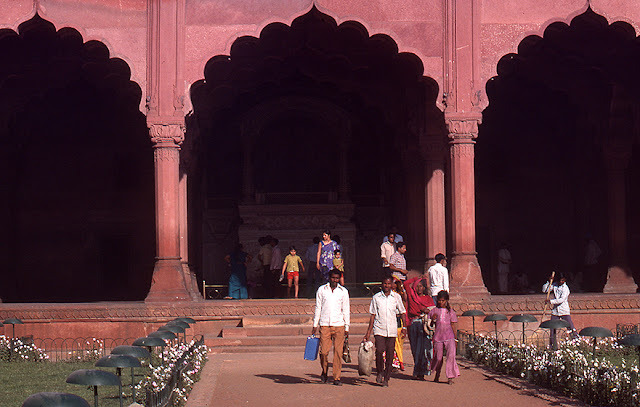 After several days in Russia, however, I was pretty sure my pictures were going to involve people, so now that I am in India and surrounded by them, I keep saying to myself, “what would Salgado do?,” and I shoot what sits before me on the lawn. Elisabeth joins me after a short while, and takes in the view as well, but eventually suggests we should get breakfast, and then go explore. Her associates will take us to dinner this evening and explain our tour plans. Fish Farms #16: It is VERY hot, but still early in the morning, when Elisabeth and I arrive in Mumbai. Our ride to our hotel is eye-opening to me, because I have never seen a city like this. 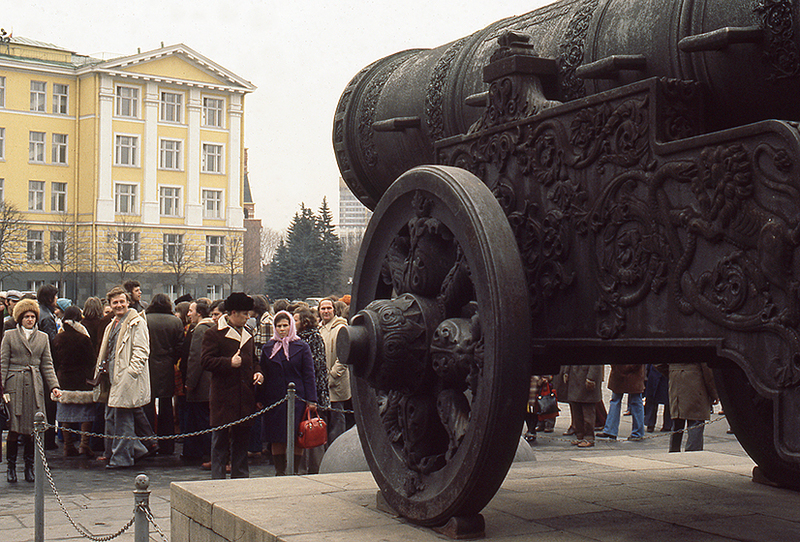 It is FILLED with people and the streets are crowded with cars, buses, bikes, and motor-scooters. When we get to our hotel, an elephant handles our luggage, and both she and I, involuntarily employ two young boys that will attend to our every need, when we are on property. After my new friend takes me to my room, I show him my equipment, explaining why I am here, and he blows up with pride to be carrying, and guarding, my gear. As I would learn, anytime I leave my cameras in the room, he sits outside the door to assure no one can enter. Once settled, I wander out onto the hotel grounds to have a look around. As it is a famous hotel, has elephants on a big lawn in front, and other attractions as well, many people come to sit on the lawn, or play. 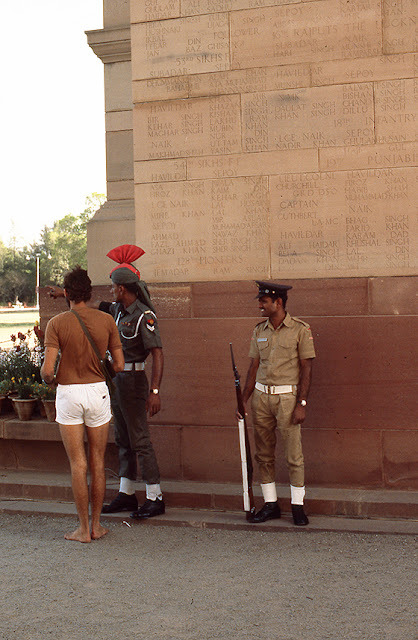 All of this is done under the watchful eye of both the military and the police, who are sartorially resplendent and fully dressed in uniform, even in this stunning, RISING heat. Fish Farms #15: Relieved to be through Russian airport customs, once on our plane to India, I sleep to recover from my anxiety, and the terrible hangover acquired at our departure banquet. We fly through the night, and when the flight crew awakens me for a morning snack, we are over India and the sun has risen. It is cloudy, but when I can see anything, it is lush and green. Then Mumbai. 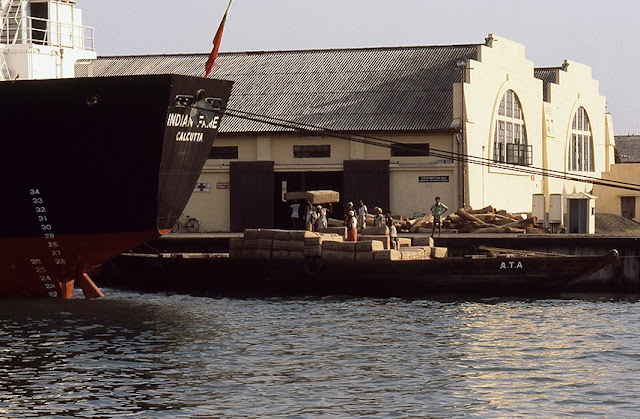 I am using the current name for what was, at the time, called Bombay. Mumbai is one of India’s largest cities, but it is surprisingly lacking things you might expect,..like an airport with a runway. Well, there is an airport, and there is a runway, but it is grass, and as we land, we awaken a sleeping camel who runs off. This is going to be VERY different! No one greets us at the airport, so we take a taxi and head for one of the finest hotels in town, the Ashoka. It is quite palatial as we drive up, and it looks like a VERY nice place to stay, but I am startled to have our luggage carried around by elephants, and within minutes of stepping out of the car, I have apparently employed a very young boy, who will carry my cameras, take me to my room, draw my bath, bring me tea, and remove my laundry to be washed. I would discover that this boy would sleep on the floor outside my door throughout my entire stay, waiting to serve me. Fish Farms #14: Our last day in Moscow is spent packing to travel and recovering from the banquet the evening before. Tonight we depart for India, and when the time arrives, our Russian associates appear with their car to take us to the airport. En route, I ask about customs, and whether I should be concerned, as I have too many cameras, too many lenses, and WAY too much film. I presume our official friends can help us if there are any problems. Instead, they all reply that “we will just have to see what happens,” noting that they have no control over airport security and regulations. That makes me VERY uncomfortable! Once at the airport, they say simple good-byes, and then just leave us to fend for ourselves. Elisabeth is shocked,..and concerned for me. It is late, so the airport is pretty quite, which works to our advantage. When we approach carry-on bag check and they see all the cameras and film, they DO freak-out, at which point Elisabeth makes a genius move. As we are early for our flight, and there are few people besides us to deal with, she opens one of her bags, and takes out her most recent Abrams book, Drama Of The Oceans. Speaking little Russian, she politely engages the customs officers concerned about all my cameras and film, explaining that she is an author, and I am her photographer, and we are doing a book about fishfarming. She tells thems we have come to Russia, at Russia’s invitation, because their sturgeon/caviar farming is some of the world’s most sophisticated. She also tells them about the unique aquaculture store, suggesting that we have pictures of all those things (we do not). The book is beautiful, and as the pages are turned, the officials make loud exclamations about shots they like, which attracts more people. By the time Elisabeth is finished showing off the book, there are 30 people standing around looking. The officials have now warmed to us, so they return her book, stamp our passports, and usher us into the waiting room, never once returning to inspect my bags further. 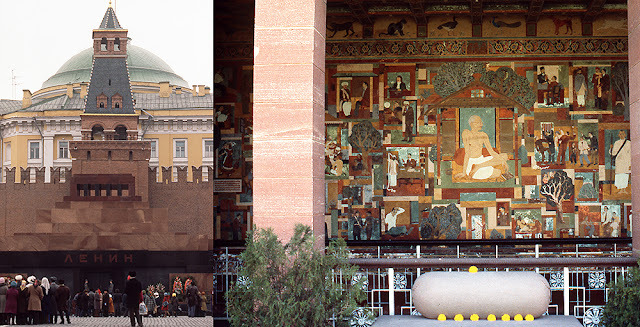 I chose the picture above to mark our transition from Moscow to Mumbai - on the left, Stalin’s tomb in Red Square; on the right, Ghandi’s tomb in Mumbai. Fish Farms #13: Fearing some kind of bureaucratic backlash, Elisabeth, her colleagues, and I are left in the dark in market devoid of shoppers, because the owner of the store believes my pictures of his place will be misused, so he has sent everyone home, and turned out the lights. We stand around for a few moments laughing about the weirdness of it all, and I can see that our Russian associates, although joking with her, are embarrassed that this has happened. With no actual shoppers to photograph, I fake a few stupid pictures with Elisabeth, and then we leave as there is nothing further that we can accomplish. It is very unfortunate this has happened because it is a great store, and it was quite busy when we arrived. Shots of that would have been perfect for the book. Apparently, it is just part of a bad day. When we return to our hotel, we are informed that we have NOT been given permission to go to the Volga to see sturgeon/caviar farming, and that is the final straw for Elisabeth. She immediately makes plane reservations for India, and we will leave tomorrow evening, flying all night, and arriving in Bombay (Mumbai) early in the morning. Disappointed that we are not going to stay any longer, our Russian friends plan a huge banquet and invite many others that know her, but with whom we have not yet visited. The location is spectacular - a grand ballroom in a magnificent hotel. The table is gigantic, seating more than 20 of us. The food is excellent, and I have my first experience with Russian alcoholism. These are people that like to drink, and they expect you to as well, and we did. Thank god nothing was planned for us the next day, because I was pretty wounded. Fish Farms #12: Elisabeth, I, our Russian colleagues, and some fishery administrators take a drive through the streets of Moscow to visit the popular, exclusively aquaculture product market where I will finally get a chance to make some pictures relevant to our proposed book about fishfarming. When we arrive, the market is, as promised, crowded and doing good business. This will make for some great pictures. At the entrance to the market, there is a statue of Poseidon that “talks,” and is silly-cute, so Elisabeth wants a picture. With my trusty Nikon and a big Vivitar flash in-hand, I shoot a few frames, which cause us to immediately be approached by employees that want to know what we are doing. The administrators with us explain everything, which send the staff running for the manager. The manager appears, again the administrators explain our purpose, and then something amazing happens. In a loud voice, he tells ALL the customers to leave the store, he sends the staff home, and he turns out the lights. He says I will take pictures to make it look like Russians are fighting over food, and he will be blamed. So now that everyone is gone, it is okay, and we can stay and take pictures. Our administrative colleagues are in disbelief, and Elisabeth thinks the whole thing is hysterical. Fish Farms #11: On our way to photograph a popular Moscow market that sells ONLY aquaculture products, I am photographing discreetly from our host’s chauffeured car. Driving through the city, I notice a constant military presence, and ponder how Elisabeth and I are being “managed.” Surely our hotel has constant surveillance on us, and we are jumping through bureaucratic hoops trying to do some inter-Russia travel. Are there others who track us also, even though we are accompanied? Were we followed on our walk around Red Square on the previous day? I was carrying a camera and taking pictures in a very public place. Then, this happened. 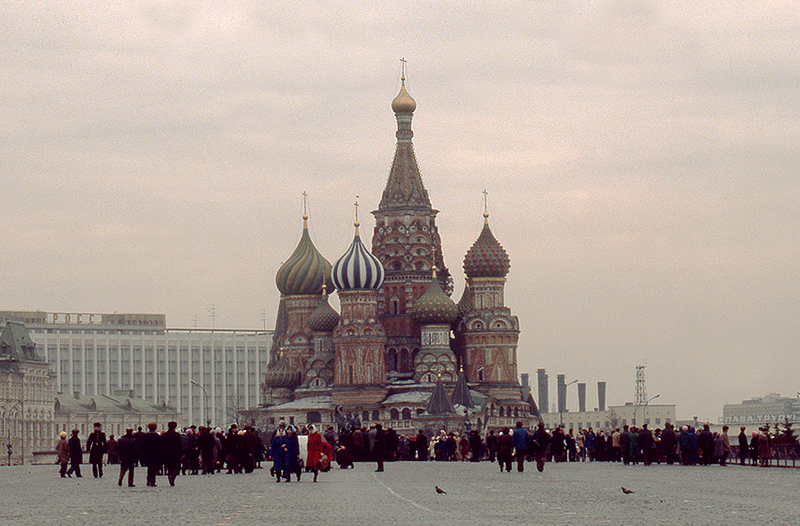 Moscow is a BIG city. We have driven around it coming in from the airport, to get to hosted dinners, and now to visit the aquaculture market, so is it just serendipity that a similar-looking blue van (post #7), joined us in the traffic flow as we were driving in from the airport? In the course of the day, I see several more as our drive continues, so I finally ask our hosts if they know the purpose of these vehicles, and the only response I receive is that they are for “public service." Fish Farms #10: Today we are still in Moscow, hoping to be allowed to travel to the Volga to photograph sturgeon/caviar farming. While we await permission, our Russian colleagues are going to take us to see a market, unique in the world, because it only sells aquaculture products, and it is very popular. Once again, we have a cold, grey day, but the car has a heater, and the drive through the city offers me new views. Much of the city seems very industrial, and construction is going on everywhere. I also see a surprising presence of the military. 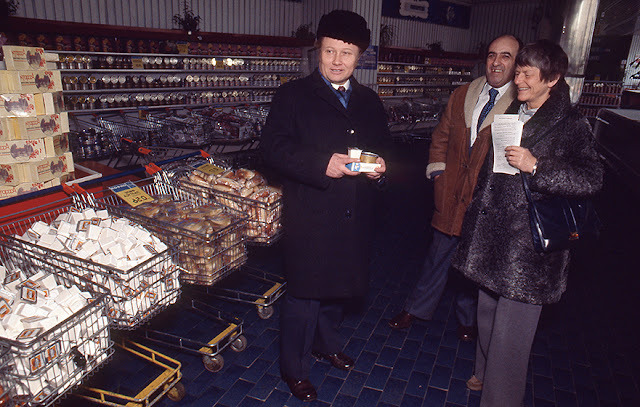 Elisabeth and I have been so pleasantly “managed” that it is easy to forget, this is Cold War Russia in 1977. Although our hosts are comfortable with me taking “discreet” pictures, I assume that, even though they are our hosts, they are still “watching” Elisabeth and me, and they would object if they thought we were doing something inappropriate. I also felt pretty sure we are being thoroughly watched at our hotel, and it causes me to ponder if there were others tracking our activities. Fish Farms #9: Our second day in Moscow is spent walking about in the cold with Elisabeth’s friends while we visit some national monuments, such as Red Square, and another nearby location that displays historic Russian armament (above). While Elisabeth is gleaning information and taking notes in her talking walk, she and I are both disappointed that we have no fishfarm subjects to photograph, as yet. This day is a sightseeing distraction for us while we await permission to go the Volga to see sturgeon farming, and it does seem that there is not much else for us to photograph related to our project, other than an exclusively aquaculture market we will see tomorrow. We are all cold after some hours out and about, so we return to the hotel early, and rest, because a special evening has been planned. We are going to the historic Russian opera house, to have dinner with our associates, and view a performance of Rigoletto. Dinner is champagne and pastries. Rigoletto is weird, especially drunk on champagne, and later, back at the hotel, I find myself beginning to wonder about the results of this trip, as it does not seem to be particularly productive at the moment. Fish Farms #8: Being food poisoned is not fun, especially when the bathroom is one that is shared, AND down the hall from your room. Nonetheless, I survive my evening ordeal AND learn something that serves me well throughout my entire life - ALWAYS carry Pepto-Bismol chewable tabs. The next morning I am functional, but their is no word about permission to go to the Volga river farming, and the Moscow aquaculture market is closed, so our group of friends takes Elisabeth and me, sightseeing. 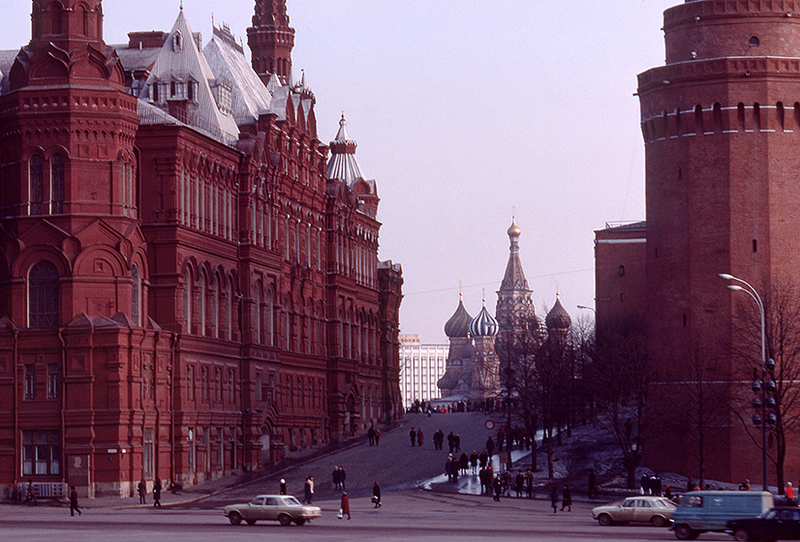 Red Square is first on the list of locations to which we all walk. It is one of those days where “the sullen Russian skies go on forever,” so Red Square seems pretty grey, AND it is cold. I do not revisit being sick after breakfast, so by lunch, I am ready to eat again, and also grateful to go inside for awhile where it is warmer. Lunch is great. Very “European,” with no unknown ingredients, and no after effects, either. I remain hopeful being sick was a brief event. As the day wears on, Elisabeth tells me she is concerned that we are not really getting anything accomplished, and that if the Russians do not show us something soon, we would leave for India. Fish Farms #7: My first view of Red Square is fleeting as we pass by rather quickly in the private car that is taking us to our hotel. We will return here as part of a tour tomorrow, but for right now, I am going to tell you what I could NOT photograph. Our hotel was huge, and a bit worn about the edges, but comfortable enough. Men and women were placed on different floors, and there was a “housekeeper” sitting at a desk in front of the elevators on every floor to assure the “rules” were enforced. There were no rooms with toilets. Each floor had a number of “water closets” that all shared. After checking in, our first day is spent at casual meals with Elisabeth’s administrative friends, as plans are made for what we will see. Elisabeth wants to go to the Volga to see sturgeon farming, one of Russia’s most financially successful forms of aquaculture because of the value of caviar - sturgeon eggs. That requests seems to carry complications and a need for permits, so in the meantime our hosts will keep us distracted with some sightseeing. 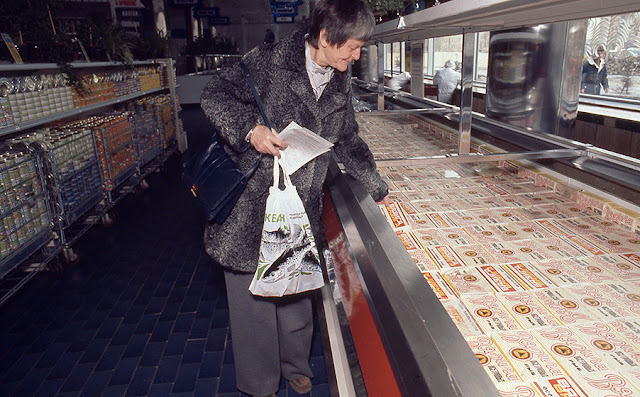 They also want us to visit the largest, and only, exclusively aquaculture product supermarket in the world, here in Moscow. In the meantime, Elisabeth’s “smaller” circle of friends wants to have a quiet banquet with us this evening. Thus, ten or so of us meet in a nice restaurant away from our hotel, and have a decent meal that does not seem too strange to me, mostly meat and potatoes, a few veggies, and an AWESOME amount of alcohol, both Vodka and champagne. Later, back at the hotel, I am both REALLY drunk AND I have terrible food poisoning. The “water closet thing” is not a fun trek, and this seems like a tough way to start a trip around-the-world. 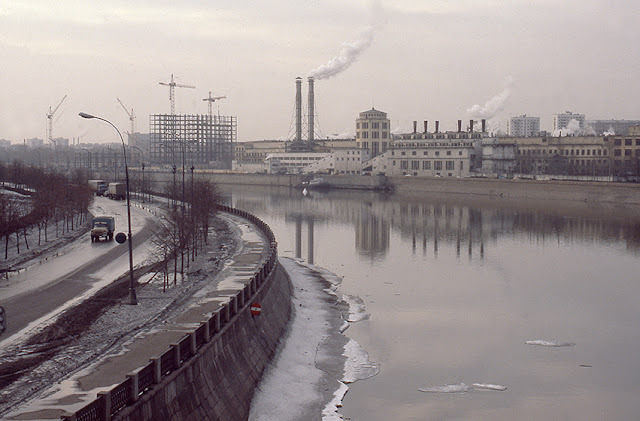 Fish Farms #6: As the official car in which Elisabeth Mann Borgese and I are being driven into Moscow gets closer to city center, the “neighborhoods” where people live, give way to the dramatic architecture at the heart of the capitol. 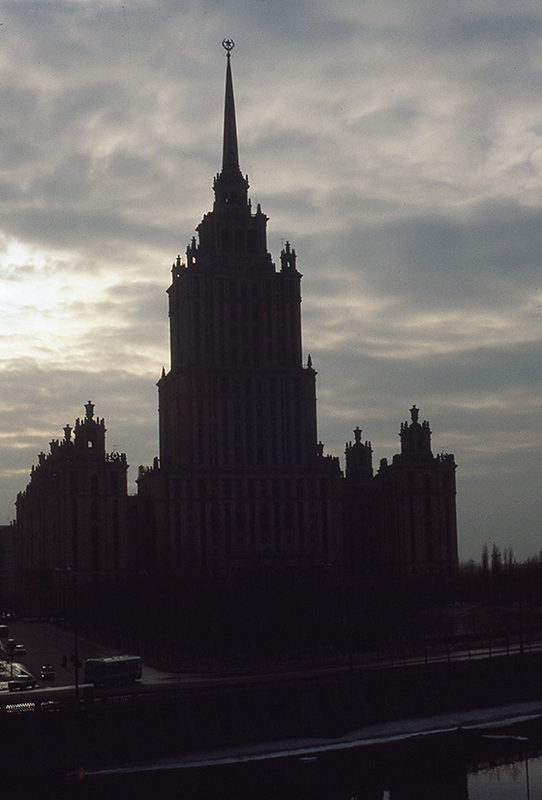 Many buildings built during the Stalin era, were designed to be ornately impressive, AND of notable scale. Our hotel is to be such a place, and we are informed that the location above is similar. It has a great ballroom where we will be hosted at a huge dinner, a few evenings from now. 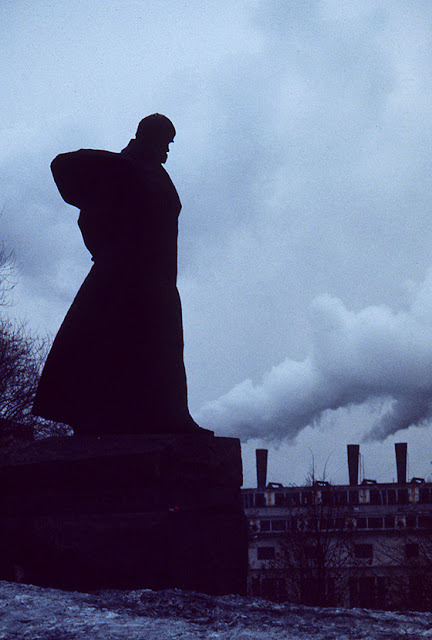 Against the morning sky it all seems a little like Gotham to me, but our new “friends” speak good English, know Elisabeth well, and seem very congenial, so I continue to shoot “discreetly,” and we motor on, soon to pass-by Red Square. Fish Farms #5: Having arrived, and survived, Moscow airport in the pre-dawn hours of the day, Elisabeth and I are now in a car with various friends and officials headed to our hotel. 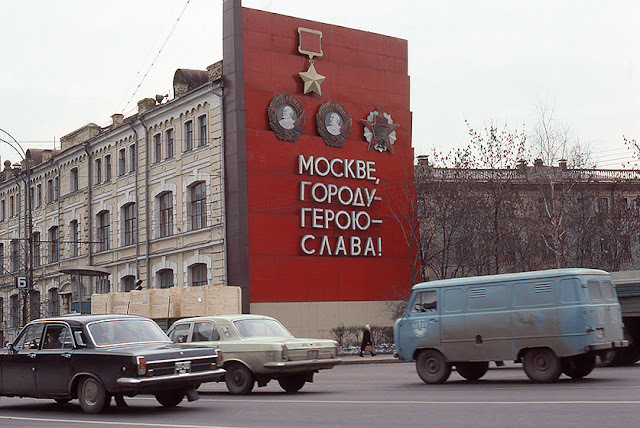 I am surreptitiously taking pictures from the car as we drive along because I have been advised to be “discreet.” It is early spring of 1977 and Moscow still has snow. It is the Cold War Soviet Union, and it is cold. 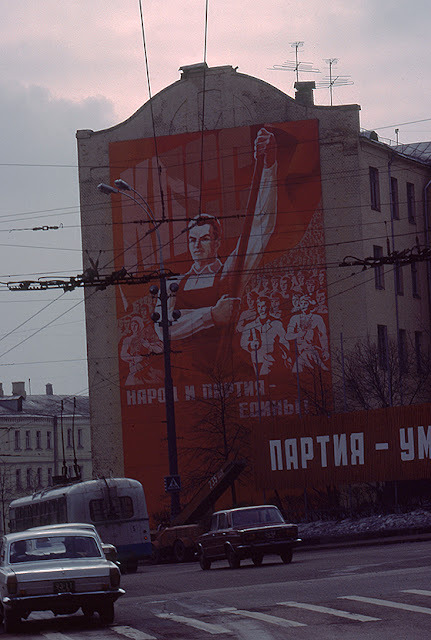 As we draw closer to the city, housing density increases and seems familiarly “European” to me, EXCEPT for the dramatic wall murals that appear with some regularity. Although I cannot read them, it is clear that most promote the Russian worker, and the work ethic. I think “Orwell”. Good graphics though, and I am a big fan of red as a dramatic color. Things begin to change, however, while our ride continues ever deeper into the heart of Moscow, particularly the scale of the architecture. Fish Farms #4: I spend 2-days at the Thomas Mann home in Zurich recovering from my time-zone travel changes, and preparing for an around-the-world journey with Elisabeth Mann Borgese, his distinguished daughter. She and I have packed impressively light, considering we will be on the road for two months, so our journey to the airport for our first flight seems well prepared and very manageable. All proceeds without incident, until we have to pass carry-on luggage through x-ray and I ask for a hand check to protect my film from exposure. I am refused, and when I suggest my “legal” rights, police with automatic weapons step up behind me, and tell me to x-ray the film or be taken out of the airport. On the plane bound for Moscow, Elisabeth and I are filling out “declaration” forms, and I read “no more than 100 rolls of film allowed” and “no more than 2 camera bodies allowed,” and I begin to sense I have a problem. I have 150 rolls of film, and 3 camera bodies. I am headed to the capitol of the Soviet Union at the height of the Cold War and my “journalist’s” appearance, and amount of equipment looks like it is going to a problem. Fortunately, upon a dawn arrival, the airport is quiet, and we are greeted by a gaggle of dignitaries. As a consequence there is little customs inspection of my gear. We are treated to an official car with our hosts, and are off to a hotel. They know I have come to take pictures, so when I ask if I can do so from the car, I am told I can, IF I am “discreet.” It is winter. It is dawn. It is weird. It is cold. This going to be an “interesting" trip. Fish Farms #3: Elisabeth Mann Borgese is a friend of mine, and respected author, who is working on a new book about fishfarming for Abrams Books. She is going to go around-the-world collecting research, and she wants me to travel with her to take pictures. England and France are the extent of my foreign travel experience, and If I go with her, my journey would start in Switzerland, then Russia, India, Thailand, the Philippines, Indonesia, Hong Kong/China, Japan, and lastly back in the US, Hawaii. My family is concerned for my health and safety. My photography community friends think I am making a bad career choice because it is “commercial” work. Companies, however, recognize my opportunity and fully support me. Nikon and Olympus give me state of the art cameras and lenses; Vivitar provides a great strobe system; and, Pelican gives me a beautiful, waterproof, locking aluminum case. Along with that gear, I pack 150 rolls of film, get a bunch of visa’s, take A LOT of inoculations, and I am off. I fly LA to NY, change planes, then on to Zurich overnight, arriving there at dawn. Elisabeth has instructed me to have a cab bring me to her father’s family home, on a beautiful peninsula that extends into Lake Zurich. 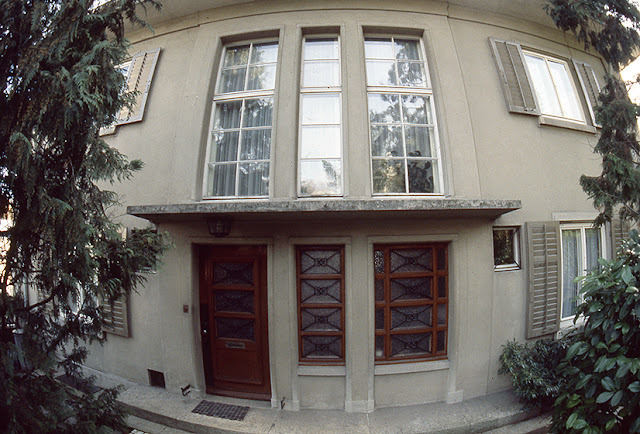 This was the home of Thomas Mann. I will recover here for two days, and then she and I will head for Moscow to begin our work. So far, so good! 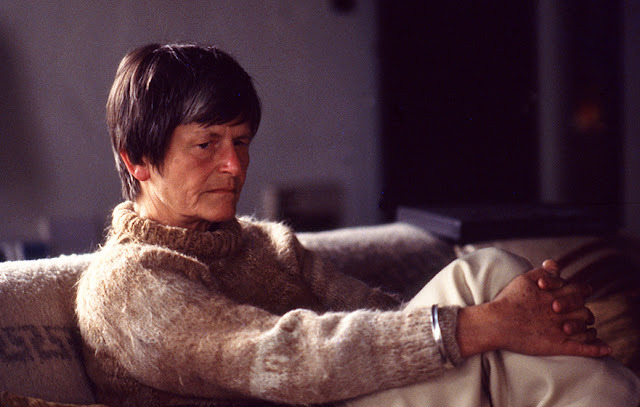 Fish Farms #2: Elisabeth Mann Borgese, is the daughter of Thomas Mann. She is also a Senior Fellow at the Center for the Study of Democratic Institutions in Santa Barbara, and Director of the International Ocean Institute in Malta, in which role she has authored a proposed Law of the Sea Treaty. My high school friend, and surfing companion, Sam Scranton, manages her SB home and her 4 dogs, when she travels, and I get to know her very well. Our relationship begins when I attend Brooks Institute in 1971, and I am around her house on a regular basis to see Sam and ride waves. In 1972, I enter the M.F.A. program at the newly opened California Institute of the Arts, so I move back to LA, but I visit SB often to see Sam, surf, and stay in touch with Elisabeth, who is quite fun to be around. After graduating CalArts, I travel a good bit, working on images for what will become my first published portfolio of prints, “WINTERS: 1970-1980”, and shooting stories about backcountry skiing for POWDER magazine. I am also working with the Los Angeles Center for Photographic Studies, curating a number of exhibits and small publications. Elisabeth has “followed” my career, and now she has proposed a new book for Abrams around the subject of aquaculture. She is going to travel around the world to 8 countries, collecting research, and doing interviews with scientists. She has received a lot of images from various scientists, so the technical photographs already exist, but Abrams loves a "beautiful picture” book, and they are concerned that photographs of the fishfarm settings are underwhelming. They suggest to Elisabeth that she take a photographer with her on her journey, and she says she knows just the person. Thus, in late 1976, Sam calls to tell me Elisabeth wants to talk with me about a commission, and I should come to Santa Barbara. Fish Farms #1: I graduated from UCLA in 1970, and in 1971, spent a year attending the Brooks Institute in Santa Barbara, learning to shoot with large format cameras, and print color. My longtime friend from high school and summers in Hawaii, Sam Scranton, ( posts #7, #12, #33-#38 ) went to UCSB, and began working as a property manager for Elisabeth Mann Borgese, a internationally known and respected author, philosopher, and politician. Elisabeth had a sprawling home on the beach in Montecito, and she had four dogs (who could play the piano). She also traveled a great deal, spending time writing at her family home in Switzerland, and in Malta, where she directed the International Ocean Institute. Sam took care of the CA home and the dogs, and as we were old surfing buddies, and there was a great break right in front of the house, many days after classes at Brooks, I would come down to the beach and we would go surfing. At some point in those visits, I met Elisabeth, and she liked me right away because I was a dog-lover. 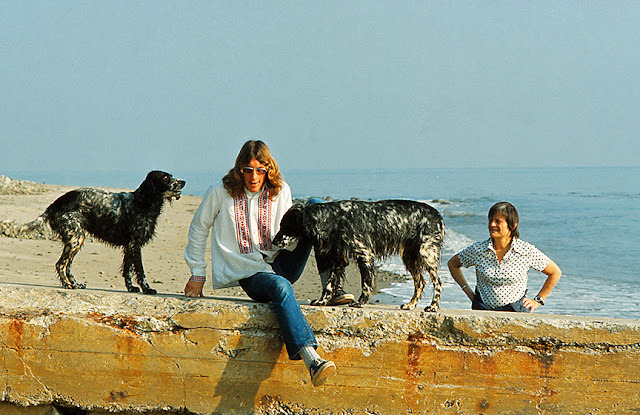 When she was around, there were many daily walks on the beach with the “pack,” and I often joined. Elisabeth grew comfortable with my presence, so I was always welcome at her house. I also joined in many dinners. She served as a Fellow at the Center for the Study of Democratic Institutions when she was in Santa Barbara, and mealtime conversations ranged from political world views, to sexual politics, conservation, and, her favorite, in particular, the OCEAN - ocean law, ocean management, oceans as a resource, oceans as habitat. They were always interesting evenings.